This popular 3 day Masai Mara Camping Safari departs daily from our offices in Nairobi. It is a 3 day budget camping safari to the world famous Masai Mara National Reserve. This 3 day, 2 night Masai Mara Budget Safari departs daily and all year round for both group and private tours. You will be met on arrival at the Jomo Kenyatta International Airport or hotel to be briefed by a company representative and then drive through the floor of the Rift Valley to the world famous Masai Mara Game Reserve. You will have lunch en route arriving at Lenchada camp/similar in time for lunch. At 1600hrs you can enjoy an afternoon game drive in the reserve. Dinner and overnight will be at the camp. You will have a full day in the reserve with both morning and afternoon game drives at 0630hrs and 1600hrs respectively. The Mara is the Northern extension of the Serengeti and its rolling plains are home to hundreds of plains game together with predators that feed on them. All meals and overnight at the camp. After an early morning breakfast we will have a game drive en-route to Nairobi City. We will have stop-over in the towns to give you a chance to buy souvenirs. We will arrive late in the afternoon. Afterwards we will take you the airport or to your preferred hotel. End of Masai Mara Safari. 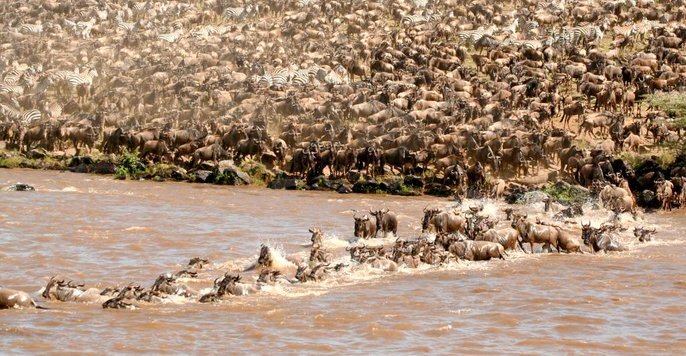 The Masai Mara reserve is Kenya's most popular game park in Kenya. Masai Mara hosts an amazing concentration of wildlife. You are guaranteed to see the Big 5. Lions abound throughout the park as do leopards, cheetah, hyenas, giraffe, impala, wildebeest, topi, baboons, warthogs, buffalo, zebra, elephants, and of course hippos and crocodiles in the Mara River. Depart Nairobi in the morning and drive to the floor of the Rift Valley - to Maasai Mara Game Reserve arriving Narok Town where you will enjoy your lunch, Later we proceed to Masai mara and we head for your afternoon game drive. Dinner and overnight at either Enchoro tented camp or Mara Sidai Camp or Masai mara. 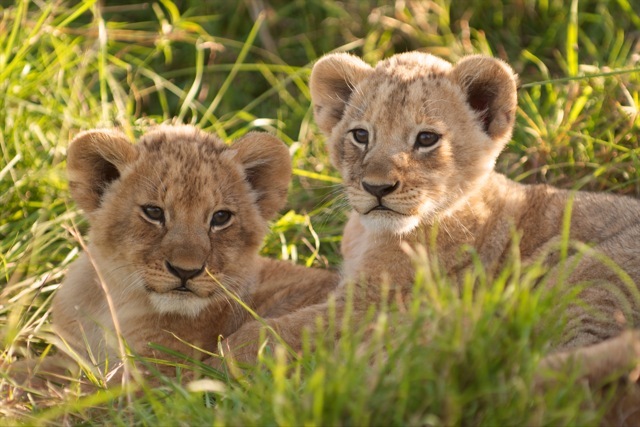 Spend the day in Maasai Mara, Kenya's most popular game sanctuary where you will have the best opportunity of spotting the Big Five - lion, leopard, buffalo, rhino and elephant. Game drives are flexible, with the option of going out with picnic lunch boxes to spend entire day in the the park, or you can choose to have early morning and late afternoon game drives. You will also have the option of visiting a local Maasai village (US$20 per person). All meals and overnight at the Enchoro tented camp or Mara Sidai Camp Masai mara. Another early morning game drive in Mara, then depart after breakfast and drive back to Nairobi arriving approx. 13:00hrs. Drop at your hotel or transfer to the airport for onward flight home. - Transportation in a custom safari minibus with pop-up roof ideal for game viewing and sightseeing. - Expenses of personal nature such as visas, travel/baggage insurance, laundry, beverages, tips etc. After breakfast pick up from your hotel around 8.00am and depart Nairobi to Maasai Mara Game Reserve with a stop over at the Great Rift Valley view point. You arrive Masai mara late afternoon, early evening and proceed for a game drive dinner and overnight at Lenchada Tourist camp. Which really forms the northern part of the famous Serengeti National Park? Meals and overnight at Lenchada Tourist camp. And overnight at budget hotel. 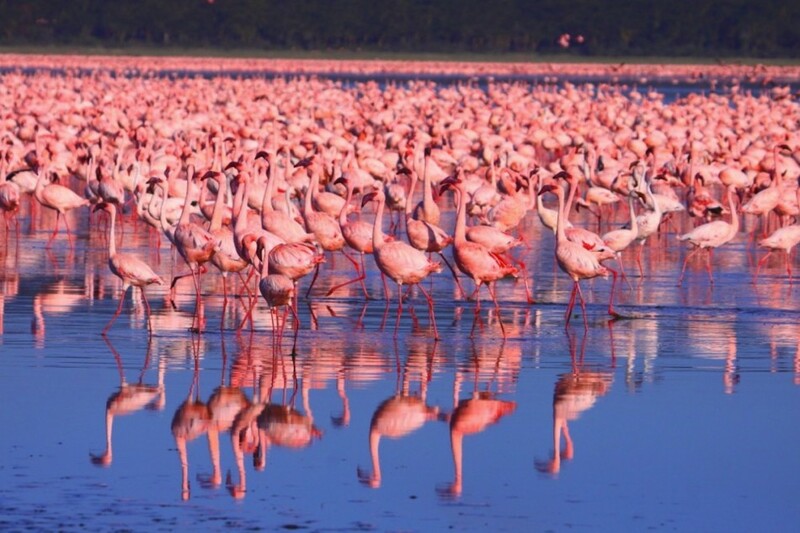 After breakfast proceed for a game drive to Lake Nakuru which is world renowned forits masses of flamingoes and is often referred to as the "Pink Lake". Beside birds, it is possible to see small game, like Water Buck, Impala, Rhino and Buffalo in the gardens surrounding. After lunch depart to Nairobi arriving around 4/5pm in the evening. The group will depart Nairobi city in the morning driving through the Great Rift Valley into Masai Mara Game Reserve. On arrival the group will check in the camp and proceed for an afternoon game drive in the afternoon returning back to the camp where we will spend two nights. The group will proceed on to the Great Rift Valley and Lake Nakuru to see the rhinos. 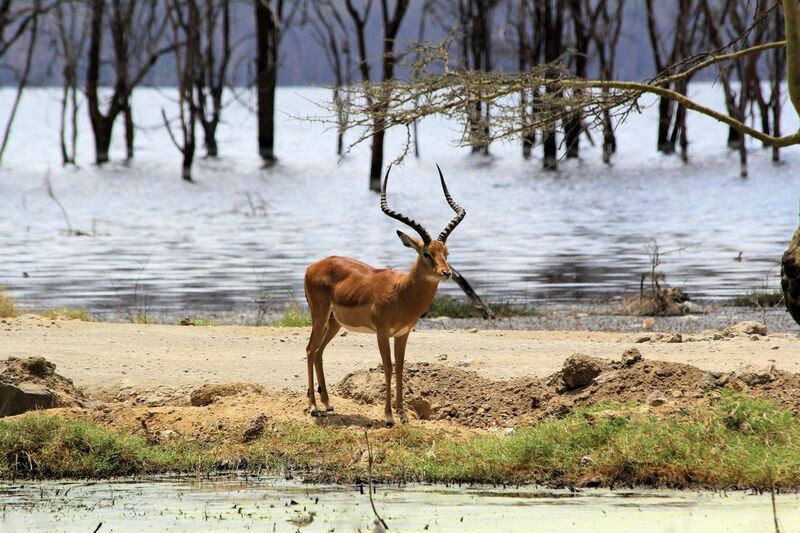 You will aso be visiting the fresh water Lake Naivasha which includes the nature walk to the Hell's gate to conclude the five day tour. The group will enjoy breakfast at the hotel and then proceed for an extended game drive in the Lake Nakuru National Park until lunch time. Then they will be taken to have hot lunch and drive to Taphe guest house for dinner and overnight in Naivasha town. The group can decide to do boat ride on the lake at extra cost. The whole day explore the parks amazingly high concentration of game. This game reserve is Kenya's finest wildlife sanctuary. Including migrants, well over 450 species of animals have been recorded here. Mara plains are filled with migrating wildebeest and zebra, there is also resident wildlife year round.The Mara's gentle fertile climate bounded by The Rift, offers perhaps the richest stocked reserve set within some 1672 sq km - an unlimited spectacle of wildlife. Located 268 km west of Nairobi, the emphasis here is on game. Herds of immense Elephants, browse among Lion, Buffalo, Thompson Gazelle, Zebra and Topi. You may occasionally sight a Rhino or Leopard but you have to be very keen since Rhinos in Masai Mara are very elusive and its not easy to spot them unlike the leopard. On this day you will explore the Masai Mara and you will have your lunch at the Mara River, this is one of the desire of many travelers as this is the point where the great Migration of the Wildebeest takes place,the annual migration of a million Wildebeest follows the rains north at this point you will also be able to spot in the Mara River Hippos play and Cross bask on the banks.After exploring the park return to the camp for dinner and overnight. Wake up call at 0600am, you will only have a cup of hot coffee and then proceed for the early morning game drive, this early morning game viewing is very important as you will be able to capture the morning kill from the big 5 is you will be lucky enough, note that most occasionally the lions are fond of making a kill either early in the morning or late evening before dark, after having like 3 hours game viewing you return to the camp or to the Lodge for main breakfast in the Camp depending on where you are staying, there after check out and then if willing you can visit the Masai Village though its optional, our driver can organize this for, then proceed to Lake Nakuru with a stop over in Narok Town for Lunch, after lunch head straight to Lake Nakuru and if time allows you will go for the game drive or if not check in the hotel, Dinner and overnight in the Budget Hotel. Pick up from your hotel at 0730 hrs and drive to Amboseli national park arriving in time for lunch at Kibo safari Camp. Afternoon game drive. Dinner and overnight at Kibo Safari Camp. Lake Nakuru's claim to fame is anchored on its flamingo's and the over 400 species of birds found here. The lake itself is a soda lake on the floor of the rift valley. The sight of the at times millions of flamingos is quite spectacular. From a distance the lake appears ringed in pink. The Lake has also earned a reputation as an important haven for endangered species- particularly the Rothschild Giraffe and the black and white rhino. Lions, waterbuck, buffalo and baboons are all residents here.